Metal plugs ending in a head and threaded so they can be tightly screwed into nuts to secure fastenings and assemblies. Metal threaded plug ending in a head; it is tightly screwed into a nut to secure fastenings and assemblies. Hollow cylinder of metal whose lining is threaded to screw onto a corresponding bolt. Widened end of the bolt, of various shapes and sizes. 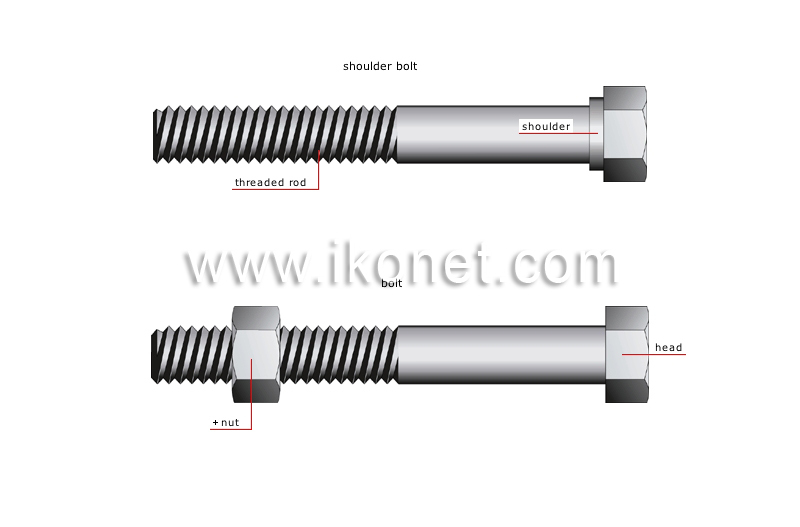 Bolt whose head comprises a section of smaller diameter for concentrating the tightening pressure. Elongated part whose surface has a spiral protrusion for screwing into a corresponding nut. Cylindrical nonthreaded protrusion used as a bracket as the bolt is being tightened.